Packaging Size: 25 kg HDPE bag with liner / 50 kg HMHDPE drum with liner. Packaging Type: 25 kg HDPE bag with liner / 50 kg HM HDPE drum with liner. We are one of the known names of the industry engaged in offering high quality Potassium Aluminum Fluoride. We offer a wide range of potassium bifluoride which is available in different compositions and used in varied industries. Further, our collection is offered at minimum cost to the clients. We also offer customization as per the specific requirements of our clients. - Reagent for introduction of Fluorine in Organic Synthesis. Since the very first day of our inception, we have been committed towards quality in potassium bifluoride which is manufactured, supplied, wholesale and exported by our firm. We are also the manufacturer of Brazing raw material. It is demanded in the market for its quality as per the international norms and appreciated by the end-users. We are offering Potassium Bifluoride. 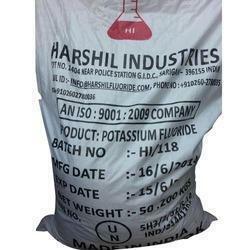 To furnish the diverse requirements of our clients in the best possible manner we are involved in offering an extensive range of Potassium Bifluoride. We are instrumental in offering a steadfast range of Potassium Bifluoride (KHF2) to our valued clients. These chemicals are accessible in various compositions that are used in several industries. Our range is widely demanded by the clients owing to its effectiveness, purity, accurate composition and high shelf life.